"Well, greetings everyone! We are so pleased indeed to be here with you. We have a vantage point that is a bit higher than it was before at the origination point of these calls. We are three thousand feet up the mountain, and it is a wondrous, sacred mountain indeed. And we invite all of you who feel so inclined to connect in with the sacred energies of this mountain called Haleakala. This has a lot to do with the heartland Lemuria, heart of Lemuria, so it is a most wondrous place indeed. So we're flying high! Alrighty! Now, there is so much happening, as you know, in every moment. Everything is changing from moment to moment. You heard a bit of a summation by Masters Tara and Rama,* and that is barely scratching the surface, Beloved Ones. "Now this is particularly true among those who have been more the supporters, and let's face it, in a lot of cases they have made choices to keep themselves and their loved ones safe within their physical bodies, or their decisions have been made to have a bit more luxury than they would otherwise have enjoyed - in other words they've been bought off. And in many cases, particularly amongst the leaders and the lawmakers of countries and various government groups, incorporations, or non-incorporations, cities, towns, states, provinces, and so on, and so on, it has been a combination of both that have, shall we say, won the loyalty of these ones who have supported. "It is very difficult for the ruler of a country to deny big bucks which are being offered for cooperation, along with a threat of termination, not just of the ruler, but of the ruler's family, friends, anybody that the ruler cares about, and not just termination, but, shall we say, a lot of pain. And it is very difficult for a ruler, or anybody who is in charge of any agency - and there are many in the alphabet agencies of the United States of America and other countries who fall into this category - it's very difficult for them to deny cooperation, especially when they stand to profit so handsomely from it. There are those who have said, 'Look, whatever you do you do; you can't buy me,' and there are sixty-some of those in the lawmaking bodies of the United States government. That's a rather small number compared to the total number of ones who are there. "Well there are those, for instance, who have left the government of Gaddafi. Now you just heard about that. Some of them are still alive, some of them are not. And when we say alive, of course we're not talking about anything except their physicality. There will be more of them, so what we're asking this Family to do is welcome these ones with the Light. Welcome them to the Light. Welcome them home. Lemuria is their Kingdom, Beloved Ones, just as much as it is yours and ours. Welcome them Lemurian style - ho'oponopono works really well, or however you choose to do it, but remember them. Give them support for their changes of heart. They do not need to feel guilty for what they have done. They may need to stand up and take responsibility for it, but they are just as entitled to live guilt-free as anyone who has lived a life in service to humanity this time around. "Now we understand that there are those that are so far gone that they have already stood before the court with Lady Master Nada presiding, and have, oh been given their sentences. These are some that are so extreme, but they are generally in the leadership, the ones we're talking about. Yes, you can call them Satanists, or whatever, but even they are having second thoughts, and that's about a million or so, and there are way more beyond that. "The car dealers for instance, who give special deals to the Illuminati, so the Illuminati bring them their business, and they know who they're supporting, but they don't really know any good way out of it. Welcome them to the Light. The restaurant that does not charge them ever to come in and partake of their finest foods on their menu, because the owner is afraid they will kill his entire family. Welcome him and his family to the Light, because they're wanting to come. That's the whole thing - they have desire, so let's give them a grand welcome! "Do you want these dominoes to fall? You welcome them to the Light more and more. It's kind of like an election in a way. What do you vote for, you, and you, and you? What do you vote for? Do you vote for the Light, or do you vote to continue supporting the dark? "So, what we are, Beloved Ones, is that we are campaigners in a way, and we are saying, 'Come onto the Light; vote for the Light; cast your ballots for the Light!' And the more that we do this, Beloved Ones, the more we get the up high fabulous vibes for ourselves, because we feel so good about all this ho'oponopono forgiving, loving, and more come to join the Light, and the faster, the faster, the Golden Age becomes firmly anchored on Planet Earth!!! And that is what we are all here in mission, in service to do, to facilitate the Golden Age, the Ascension of Planet Earth. And we're going to have some Golden Age announcements coming up real soon - no dates of course. "Let us remember the heroes who are already working in the Light. You know the rest of story about that space mission for Captain Kelly - not only has he come through the most horrendous, heinous crime perpetrated against his beloved wife, but he flew the mission. And that mission had a few dark ones who really wanted to do some mischief there. We knew about it. We made sure - safe journey out and back. Why? Well, Tara and Rama told you the importance of it, and so it is. "Captain Kelly and his Beloved Gabby are Lightworkers of the highest degree, so pause for a moment and honor them, and send them your Light and your Love, as we send ours. She is a miracle you know. She chose to stay. It would have been far less painful for her to leave on that day when she was shot in the head. She chose to stay, because she knew that her mission was not over, and she also knew that she had many, many, wondrous beings depending on her. Children, her staff, her constituents, the world, and her beloved husband, and she knew that it was important for her to stay, she knew not necessarily all of the details, but she made the choice to stay, and not only to stay, but to recover. And she has the ability to recover completely. It's in her energy fields, and she will be receiving more and more, shall we say, assistance. "The technologies are actually already anchored on Planet Earth. The Arcturians are very busy these days with the Crystal grid, and with their, what are being called their hospital ships, their activities of applying the technologies for healing and balancing that they have. So another reminder - you have many, many, many, assistances available to you if you have some kind, any kind of a situation, with your physicality. Get to understand it. Get to understand the wisdom of why this is occurring in your physicality, or your mental, or emotional, or spiritual bodies, or any part of your energy fields. What is it? What's the wisdom? "Sometimes the simplest explanation, or the simplest phrase, can help you. You know there is a woman who healed herself years ago, and she has a publishing company - it is called Hay House. It is a publishing company now, and her name is Louise Hay, and she's written a dandy short little reference book for all the different body parts, and things like anxiety and depression and so on. And we don't want to go there, and we know that, but anyway if you have something that is troubling you, look it up in her little book. Google it, look it up online, and that gives you a clue, and then you can see what it is that is in your own particular self that you can help yourself with. And then you can do some energetic exercising, communion, communing with your guidance group, your MAP Team, the Arcturians, anyone that you choose to be on your team for assistance. Alrighty! And we are on Gabby Gifford's team, and we are absolutely thrilled to be on yours, so just call upon us if you choose to! "Now we want to discuss this whole Memorial Day. You all know what it's about. It's about honoring those who fought in any kind of capacity, or served in any military uniform, or for instance nurses on the battlefield, or behind the lines, or whatever. All of you wonderful, wonderful, beings who so courageously experienced the horrors of war. It has scarred many of you. And for those of you who were actually engaged in war activities, whether you flew a plane that dropped a bomb, whether you fired a gun, or planted a land mine, or whatever your activity of war was, we know that many of you now have your new understanding of why these wars have been fought, or how they have been manipulated, and how people have been manipulated into fighting for the behind the scenes Illuminati, and of course they had partners** who have left. "It is important for you, not just to understand the manipulation, but it is very important for you to move past any kind of guilt, or even contrition that you might be feeling. You had a whole different set of rules that you were given. It matters not who laid down the rules. Those were rules that spoke of honor and valor, patriotism, defending your country, defending your family, your homeland, making the world a safe place, bringing freedom to people who were oppressed. Those are the truths, at least the major part of the truths, of why so many men and women, whether they were what you call drafted, or volunteered. Those are the reasons for going to war. And there are other kinds of wars, for instance you may be at war with a neighbor, or a spouse, or whatever, defending your family, defending your home, sticking up for your rights. Those reasons all have validity, because they are reasons of honor. "Even though the reasons behind the reasons may have been manipulative, those who put on the uniform of the military, regardless of which military it is, which country it is, or state, or whatever, are doing so because it is the honorable thing to do. And you know there are armies. There are armies of Peace. There are armies of assistance. There is one in particular who is with us tonight as she always is, and that is Sekhmet, and you have heard that Mother Sekhmet has an army, and yes she does, and they are armies of bringing balance to the world, let us just say, because the world needs some help. "You have requested and given permission for help. And it is not that Sekhmet's armies are totally engaged in war. They are more often engaged in protective capacities. And, but it is important that you understand that. One called KOS himself is engaged and has a position of protection of the President of the United States of America. Now that is a form of service which is not necessarily thought of as active military, but yet it is, in a way. He is prepared as are the others to defend at all costs, including their physicalities. Of course he's already ascended, but nevertheless, we shall go on. "We are wanting to focus upon Peace, and that means that everyone who has put on a uniform of the military, no matter what their role in the military has been, needs to be at Peace about it. Now, this is worldwide, we're not just doing this Exercise for those in our Family - It is for everyone who has supported any kind of military action - the wife or the sweetheart who has waited at home for her soldier to return, the mother who has left her children because she is in the reserve and her unit has been called to active duty - anyone at all who has served, or supported the military. "Even as these, let's face it, huge, horrendous, details are coming out about the reasons behind the reasons, about the manipulations, about the phony attacks, for instance the attack upon the USS Cole was all staged, just like 911, just like the Gulf of Tonkin. Does anybody remember that one from Vietnam? Even though the reasons behind the reasons were manipulative and designed to serve the few, nevertheless the honor was there. "What do you think you people who live in the United States of America, or in any of the so called free world, what do you think, what do you think of when you see a picture of George Washington standing in that boat crossing the river with his ragged army? Yes, that one was manipulated too, but it turned out well for the United States of America. I mean there is the United States of America, because the people declared their Freedom. "What do you think when you see and hear that in the African Nations and the Middle East, people are being slaughtered for daring to speak out, for daring to cry out for their freedoms. Yes, well you'd say it has to happen, the world has to be free. They are no less soldiers than anyone else. They are willing to give their bodies for Peace, for Freedom, for the 'Peace that passeth all understanding.' They are lighting the way, Beloved Ones, to the Golden Age, just as anybody who has fought in any war, or served in any war with honor in their hearts, because that, Beloved Ones, was and is their Truth. So if there is anyone in this Family who has any feeling of, 'Oh I wish I hadn't gone and dropped napalm on that village in Vietnam.' - if there is a guilt associated with it, it is time to give it up. It is time to understand you have been soldier, warrior, conqueror, and you have been victim. "And we will quote God. You know the books about the Conversations with God? There is one called Communion. We like that one. And as the conversation goes - and it is being discussed that wars are really not a very happy, good thing for Planet Earth - and the question is: 'Well, then why are we building statues to war heroes?' and the answer is: 'Lest you forget'.” And that is part of the war story, is it not? Yes, there are always victims, there are ones who are hurt - everyone from babies still in the womb to the old folks, who cannot get out of the way of the bombs fast enough, or whatever is happening. "Honor them for their courage. Honor them for showing that Planet Earth is finding a better way. Planet Earth is on the upward path of Peace, and that's what we're about! We are warriors of Peace coming together, raising vibrations high, high, high to send out these loving messages of 'Welcome home, welcome to the Light, and by the way ho'oponopono. All is forgiven, because there is no judgment, it's just what happened at one time that has led to the glorious now moment. "And so it is to leave the past, to be in the now moment of Ascension preparation, and to, yes, honor the honor, honor the courage, honor the heart, the bravery, and the ideals which are timeless and worth remembering. That is what is to remember, and it is to forget the ways of war. Or rather should we say to disallow thoughts of war, whether they are within your own self, whether it is the anger you feel when your neighbor runs over your petunias along your driveway, or whether it is the anger that you feel when innocents are giving up their physicalities, because somebody is shooting at them. "Give it up, and view the World as a Light, beautiful place, full of Love, more and more Love all the time, because you, Beloved Ones, are joined with us. We are One! We are Family! 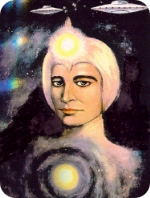 We are Ashtar Command! We are bringers of the Light! We are holders of the Light! A nd we are indeed givers, broadcasters, if you will, beamers of the Light of Love to the entire Planet. "And we invite all to give up contrition, because contrition leads to guilt if it stays around very long. It's good to say, 'Ooops, I maybe made the wrong choice there, and shouldn't have fired my gun.' But if it settles into a person's being, and becomes heavy guilt, it needs to be cleansed. It needs to be forgiven. It needs to be without judgment of the person. It's OK to say, 'Well, you're right, that really was not a very good action. But you are a good, wonderful, Being of Light, so let your Light shine. And maybe you can even inspire others to let their Light shine, instead of firing their guns.' How about that? Well, that's just a thought. But this is Memorial Day, and what is memorialized here is the bravery, the courage, and the moving forward on the path, no matter what the obstacles may have been in the past. "This is clearing that obstacle of any guilt, or anger, or residues that are somewhat 'icky-sticky' in your being, that have to do with those kinds of activities, thoughts, words and deeds. So let's get on with it shall we, Beloved Family, and let this be the day of remembrance of Peace, and let this be the day that the Peace warriors come out in even greater numbers to march world-wide. We're shining the Light of Love everywhere, everywhere, upon Planet Earth, below, on, and above, and let this day, this Memorial Day, be remembered as a day of Light, a day of Love, and most of all a day of lasting Golden Age Peace!!! "And so we say to you Beloved Family, thank you for being here on this most special day of days! The page has been turned. The torch has been passed to the armies of Peace on this day. Feel it and be it in the Love of the One We Are! And so it is! Salut!" * http://www.2013rainbowroundtable.com/ ** the Annunaki	Transcription by Arnold Neal Troeh	Given through Susan Leland, May 31, 2011. www.AshtarontheRoad.com © Ashtar On The Road Publications 2011. All rights reserved; however, this is a gift to all of us and it may be distributed freely on condition that all accreditation is acknowledged and that no part is altered or deleted.